’Bezier Chine’ is a design and construction method to fabricate true round metal hulls. It does not just imitate a true round form. It is a true round form in every respect, just like a fiberglass designed hull. It is easier to build and requires far less metal working skill and equipment over building a true round hull by traditional means. The entire hull surface is pre-engineered. All plating fit seamlessly to a specified location on the hull framework. 'Bezier Chine' builds on the concept of 'Radius Chine' construction process. While both method divide the surface of the hull in length into short segments. The difference between the each method is the shape of the segment. 'Radius Chine' use a single radius for each segment, while 'Bezier Chine' uses computer developed free-form segment that vary in radius along the length of the hull. 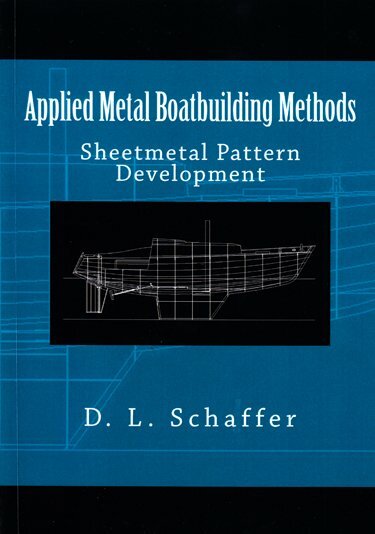 This principle is detailed in 'True Round Metal Boat Building'. 'Bezier Chine' design and construction is illustrated thru the building of the "Bezier 12.5", a small, curvy, aluminum, tumblehome design. In short, if this curvy little boat can be built using the 'Bezier Chine' construction method, any other true round hull shape would be a breeze. There are three Hull Plating arrangement used by Bezier Curve Design and are referred to as Types One thru Three. The purpose of three plating arrangement is to continue to allow the ease of fabrication by designing in developable surface when desired. A Type one hull design places the true round section of the hull between two developable surfaces. This arrangement would be most appreciated and familiar to 'Radius Chine' builders. For that reason, it was the initial arrangement use to develop 'Bezier Chine' design. A Type two design run the true round section from sheer line to and including the turn of the chine. This arrangement allows most of the hulls true round surface to be above the waterline, and can include such hull features as tumblehome into be design. The Bezier 12.5 uses this arrangement. A Type three arrangement would run the true round hull from the sheer line around the turn of the chine to the fairbody line of the hull. Type 3 is the logical extension of the Type 2 arrangement bring the "Bezier Chine" method full circle to a true round fiberglass hull configeration. There are no developable surfaces used in this configuration. 'Bezier Curve' does not use any of the traditional arcane and obscure skills such as line heat, the English wheel or explosive and hydraulic forming. The hull plating is shaped by time tested metalworking methods. There is nothing vague about the method. You can see the process thoroughly by following the building of the "Bezier 12.5" and reading my book 'True Round Metal Boat Building'. Available at Amazon and on Kindle. 'Bezier Chine' corrects the three significant unresolved issues with 'Radius Chine' design: By its own nature 'Radius Chine' does not produce true round hulls, It limits hull shape and forces the greater portion of the curved section at the turn of the chine below the design waterline making the hull look slab sided. There is no visual advantage of having a radius at the turn of the chine if you cannot normally see it. Shell panels are shaped using a cold forming "Press Break" process. The method is simple, consistent, and predictable. 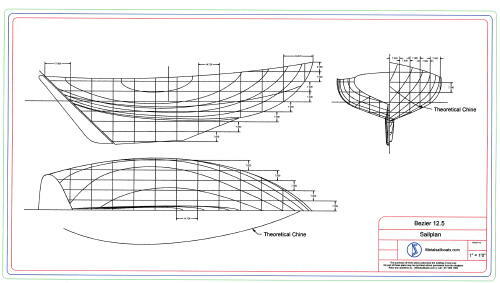 Bezier Chine Design produces full size flat patterns of the hulls three dimensional surface. Information such as bend angle, forming line, and reference dimensions needed to form the flat patterns to its original three dimensional shape are also provided with the each patterns. The curved sections of this hull fit together easily, with minimal adjustment onto the framework. 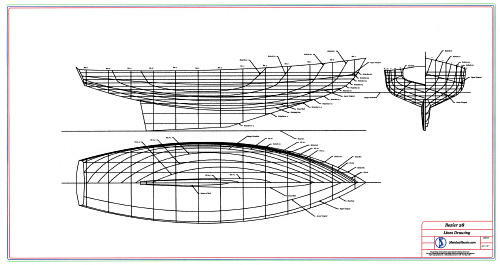 The pre-engineered design and fabrication method enables an average person to build a true round bottom hull using the same skills as required in hard chine construction. The result is the unmistakable beauty of a round hull - the uninterrupted graceful line curving to meet the water.